PRESALE - foster parents, first time parents & grandparents, teachers, nurses and active duty military personnel shop early too! 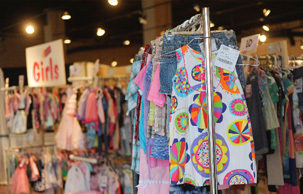 The biggest selection of kids' items from local Austin families all under one roof! Toys, clothes, shoes, furniture, strollers... everything you need as a parent, maternity to teen! JBF inspects all items for quality & safety - checking every item for recalls so you can feel confident providing for your family. We gladly accept cash and credit cards including Visa, Mastercard, Discover and Amex. Sorry, no checks or money orders! For safety reasons, no kids, strollers or wagons aside from infants carried by you or in a sling/carrier allowed at Presale. **Take an extra 50% off items without a star on the tag! HUGE space with 13,000 square feet of savings! Lots of parking spaces (Absolutely FREE, convenient parking)! We understand, kids are expensive and they grow fast. So we created a community event, where you can shop 50-90% off retail on thousands of items. Giving parents an affordable option for things they need and want for their growing families. We have events each fall & spring, so sign up to keep in the loop about the next event in your area! Good setup and great selection and prices! Selling our children’s unneeded clothes & toys and meeting new people!! !